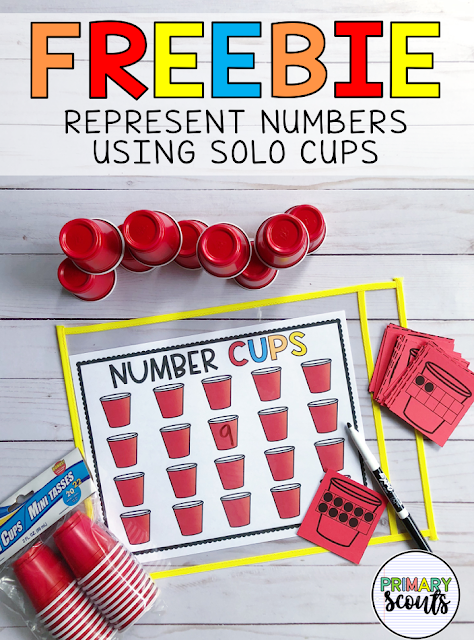 Engage your students this year with red solo cups during math centers. Last year, my class LOVED counting cups to 100, building numbers, and solving equations by creating cup structures. It's a fun, engaging, and hands-on way for K-1 learners to develop number fluency. Keep scrolling to download your FREE resource. This freebie gives you resources to use at various times during the school year. For representing, you will just print the 10-frame cards onto cardstock and cut them apart. Pair the cards with a Number Cup recording mat and a set of cheap bathroom cups or mini solo cups and your students are ready to represent with cups. For addition and subtraction, you will print the recording sheet on cardstock and either laminate or place into a dry erase pocket for longer lasting use with an expo marker. Pair the mat with flashcards or dice for solving and the same set of mini-cups you used for representing numbers. Fun, easy, and cheap are three of my favorite words! I hope they're some of yours, too. If you're ready to scoop up this freebie - you can do so by downloading it from my Teachers Pay Teachers shop.